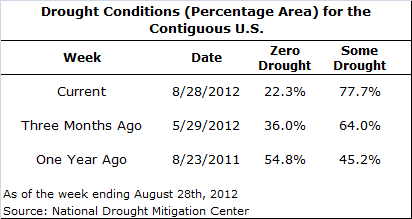 According to the National Drought Mitigation Center, as of the week ending August 28, 2012, 77.7% of the contiguous U.S. had some form of drought impact. This figure is an increase of 71.9% over the same week in 2011. It is anticipated that the levels of drought will continue to intensify at or above current levels. What does this mean to the waterpark operator? How do waterpark operators respond to such an increase in drought conditions? The word “drought” has several meanings. Technically, the measure of drought is defined by the type of impact it has on the environment (agricultural, meteorological, hydrological, and socioeconomic). However, let us keep it simple. A drought condition, in the eyes of the general public, means little water is, or should be, available for use on non-essential functions. I was recently asked about responding to negative perceptions that arise when the words “waterpark” and “drought” are mentioned in the same sentence. My response to such a discussion continues to evolve with an ever-increasing awareness of sustainability issues within the waterpark industry. There are some basic truths the industry must communicate to the public if it is going to overcome negative water-use perceptions. In my opinion, there are five topics that should be discussed in any conversation regarding water use at waterparks. First and foremost is a statement of understanding regarding the difference between water use and water consumption. It is true that a waterpark is a highly intensive water use attraction. After all, it is the water that provides the thrills and spills of a high-energy afternoon in various water-based activities. However, the percentage of water actually consumed at a waterpark is relatively low when compared to the amount of water being used. For example, one outdoor waterpark with an initial fill of 900,000 gallons consumes approximately 2.2% or 19,500 gallons per month. This waterpark uses 900,000 gallons of water, and consumes only 19,500 gallons per month. For a common ground of understanding, water consumption at a waterpark is measured by the amount of water being discharged into the sanitary system, or otherwise lost through evaporation, backwash operations, splash out, and deck wash down. Since a majority of the water at a waterpark is reclaimed, water consumption remains low. For the waterpark operator it is important to communicate the difference between water use and water consumption. Identifying the difference between water use and water consumption leads directly into the second topic: Water consumption comparisons. The key in discussing this topic is to ensure that apple-to-apple comparisons are made. The lowest common unit of comparison among different facilities that consume water is GPCD, or gallons per capita per day. A particular facility derives its GPCD figures based on fixed and variable components of use and occupancy. For instance, water consumption at a hotel varies based upon how many rooms are occupied. A restaurant consumes water in proportion to the number of meals it serves. A waterpark is no different. A waterpark consumes water in proportion to attendance. However, a waterpark consumes less water on a per capita basis as attendance rises due to its relatively fixed water use and low water consumption. The following table identifies comparisons of gallons per capita per day water consumption for various uses. 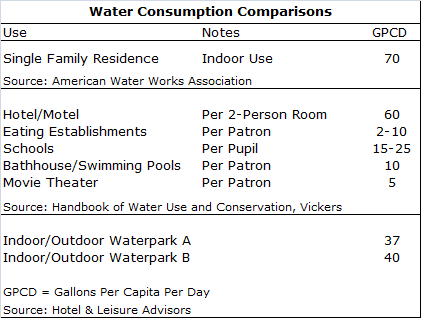 The water consumption values indicated are based upon research of various published sources and H&LA’s own analysis of two waterparks’ actual water usage information. For the waterpark examples shown, the figures calculated are from year-end 2011. The chart reveals that on a per capita basis, water consumption at waterparks can be well-below established figures for uses such as hotels as well as single family residences, especially at higher attended properties. However, there are difficulties with such a comparable analysis, as the complexities in trying to establish comparison in terms of size, design, age, and operations between facilities are significant. The third topic of discussion is the recognition that water conservation is an inherent, naturally occurring design principle for a waterpark attraction. Are the owners of indoor and outdoor waterparks concerned about water use and water conservation? Absolutely! The primary objective for any owner is to reduce their expenses. After all, a waterpark is a business like any other. Expenses such as labor and utility costs as well as water and sewer costs are critical components of a waterpark operation. Owner/operators do not want to spend more on energy than they have to in order to operate at the peak of efficiency. Aquatic architects and engineers are constantly evolving their practices to recognize the importance of reclaiming and conserving water at every opportunity. From increased depth of deck aprons to higher splash guards to more efficient filtration systems, each design consideration is specific to reclaiming as much water as possible. The more efficiently the water in the system is used, the less water is needed for maintenance and topping off, resulting in less water consumption. At the bottom line of every waterpark operation, design practices should be in alignment with water conservation concepts. The fourth topic of discussion is the best management practices (BMP) that waterpark operators utilize in order to operate their parks at the peak of efficiency. The ability for waterpark management to proactively monitor water levels and water flow throughout the aquatic area is a vital BMP for a waterpark. Portable flow measuring devices are used for spot checking the water flows to the various water features and attractions. These spot checks readily identify leaks and inefficient water use before the issues become large problems. These devices give management the ability to react in a reasonable time frame. They are also used to provide a checks and balances system for understanding water use when compared to the overall waterpark water meter readings. Other best management practices include focusing on water consumption in accessory uses to the main waterpark attraction. These uses include the food and beverage operations as well as hotel or condominium operations at larger indoor waterpark resorts. These BMPs include practices such as “water upon request,” full load dishwashing policies at facility restaurants, and linen re-use programs in lodging accommodations. Through best management practices, waterpark operators are advancing their interests as good stewards of their communities and the environment. My conversations regarding water use and consumption at waterparks typically end with an eye toward the future. Industry engineers are constantly seeking innovative ways of reducing water consumption at these water-intensive attractions. The technological advancements that have been achieved in water filtration have exponentially reduced water consumption at waterparks. I anticipate further reduction in water consumption in the industry as older facilities switch out and opt for more efficient equipment, and new construction facilities leverage the benefits of recent innovations. For example, according to their website, Neptune-Benson’s Defender® Regenerative Media Filters “dramatically reduce the backwash waste, provide cleaner water quality, save on chemicals and energy, and are significantly smaller than a traditional sand filter system.” Dave Gower, Waterpark Maintenance Manager for Kalahari Sandusky, illustrated the difference. “A traditional sand filter consumes 1,500 gallons of backwash per filter per day. With the Defender®, water consumption is approximately 450 gallons of backwash per filter per month.” In addition, he stated the anticipated ROI is between three and four years. During this heightened awareness of drought and the sensitivity associated with water use during drought conditions, how can a waterpark operate in such an environment? The answer is prehensible: the industry needs to continually educate the public. A paradigm shift needs to take place. The perception of water consumption at a waterpark needs to be one of water conservation. 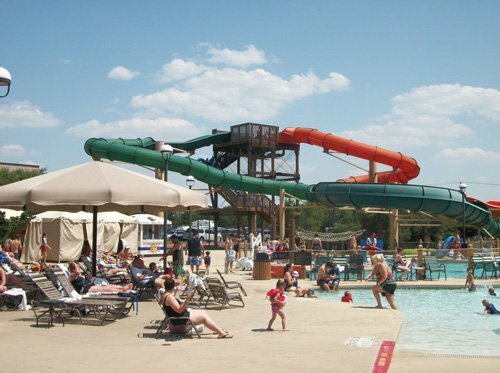 Through an informed discussion that includes an understanding of the difference between water use and water consumption, basic water consumption comparisons, inherent water conservation design principles, waterpark operation best management practices, and industry innovations, the ability to make a shift in public perception is within the waterpark industry’s grasp. Developing a drought management plan in response to a jurisdictional drought declaration is a method of communicating how a waterpark will respond to a specific level of drought emergency. In general, a drought management plan contains three areas of communication regarding water use. The plan identifies the water conservation techniques inherent in the design of the facility. The plan establishes water conservation best management practices (BMPs) for operating the facility and it provides the waterpark’s official response to a jurisdictional drought declaration. Typically, a jurisdictional drought declaration contains several different levels of emergency. A drought response plan tailored to these different levels of emergency is becoming a more common occurrence, even to the point of the drought response plan being a codified requirement of some municipalities in drought stricken regions. As an overall tool for communicating waterpark water use and consumption, developing a drought management plan is a key strategy for addressing water use concerns. For more information concerning drought management plans for waterpark resorts please contact Hotel & Leisure Advisors’ Director of Development Services, Eric B. Hansen, AIA, ISHC. He can be reached via telephone at 216-228-7000 x21 or via e-mail at ehansen@hladvisors.com. Eric B. Hansen, AIA, ISHC is the Director of Development Services for Hotel & Leisure Advisors, a national hospitality consulting firm. Mr. Hansen is active in performing appraisals, market feasibility studies, economic impact studies, property condition assessments, and impact studies for hotels, resorts, waterparks, golf courses, conference centers, and other leisure properties. Mr. Hansen offers more than 17 years of experience in the hospitality industry. As a hospitality consultant with a foundation in consulting, architecture, financial management, and appraisal theory, Mr. Hansen brings well rounded expertise to various H&LA assignments and assists H&LA clients with their pre-development, consulting, and valuation needs.